Who doesnâ€™t need a little refreshment after a long lazy day in the sun? The Sun Bum 'Cool Down' Aloe Spray is a continuous spray enriched with Aloe, Cucumber Extract, and Vitamin E. Altogether these will hydrate and replenish your skin's natrual moisture balance. And since it is a dry touch formula there won't be any sticky, goey mess to deal with. 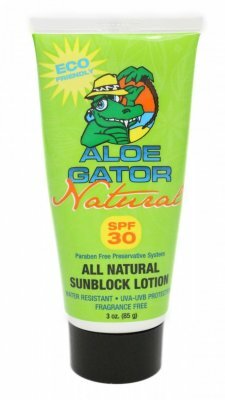 Aloe Gator Natural SPF 30 Lotion 3 Oz. Earth-friendly, all natural formula contains a natural preservative and is water resistant. Non-greasy, satiny feel. Unscented. This quick drying pump sprays offers added UVA/UVB protection with Parsol 1789 and are very water-resistant. Oil free and PABA free. Convenient hands fee application is great for sports and water activities. Gentle Lil Gator formulation is perfect for kids. 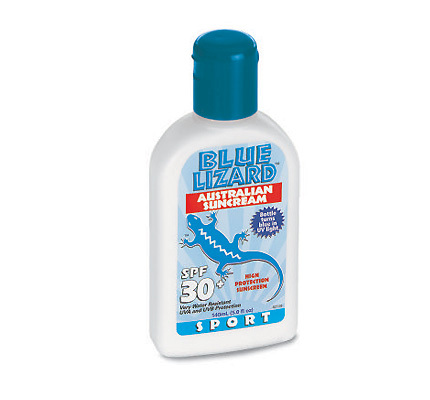 Aloe Gator SPF 40+ Gel 4 Oz. This is a TOTAL sunblock protection in a super waterproof gel formulation. 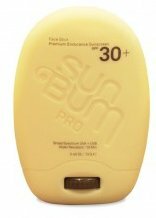 It's the premier sports sunblock used by professional surfers, scuba divers, sailors, tennis players, golfers and climbers. 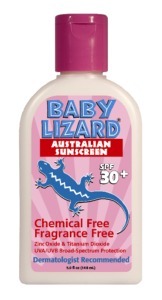 Blue Lizard Baby - Chemical free, fragrance free formula, SPF 30 formulated in Australia to meet the world's toughest sunscreen standards. Bottle turns pink in harmful UV light. 5 fl oz. Avoid polluting the ocean and irritating your skin with conventional sunscreens that are often formulated from harmful parabens and other forms of toxic allergens. Caribbean Solution's Solguard SPF 15 Natural Sunscreen is a non toxic, unique blend of natural skin conditioning ingredients along with the natural minerals, Titanium Dioxide and transparent Zinc Oxide, that provide true Broad Spectrum Protection, blocking both UVB & UVA sun rays. Natural ingredients, including Cucumber extracts, Organic Aloe Vera and Kukui Pod oil, assist the skin's ability to hydrate and cool itself when exposed to harsh sun exposures. Added to these natural hydrators are plant extracts which have natural photoreceptors that shield the sun, such as Wild Pansy; Hibiscus plus Green Coffee Bean, a natural preservative and anti oxidant. Natural Sunscreen SPF 15 gives you maximum sun protection together with nutritional value for your skin, a combination seldom found. Formula II is a great all-purpose skin care product that works best as a moisturizer. This product includes 3 different moisturizing oils. The Chilly Dana is an all-sport, all-terrain, all-purpose evaporative cooling bandana. It absorbs sweat and keeps you cool during a workout, hard ride, tough climb or any other strenuous or warm weather activity. Perfect for doo-rags and neck wraps. Double sided embossing makes the Chilly Dana a perfect function cooling towel. Size: 26" x 26" x 36 3/4"
The Chilly PadÂ® by Frogg Toggs provides an innovative way to cool down while enduring outdoor heat and/or high levels of physical activity. 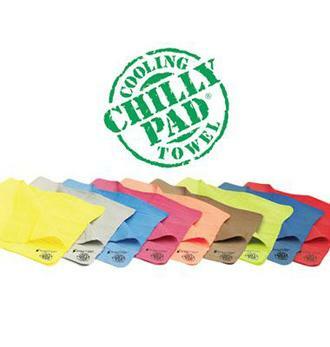 Perfect for anyone engaged in sports or work, the Chilly Pad is made from a hyper-evaporative material that retains water while remaining dry to the touch. When wet, the towel begins to evaporate and cool, providing cool, soft comfort to the user. When it stops cooling (about 1-4 hours, depending on conditions), you simply re-wet the towel in hot or cold water and wring it out. Within minutes, it's cool again. It's also machine washable, and comes in its own storage container for years of reliable use. Handy size: 27" x 17"
This quick drying pump spray offers added UVA/UVB protection with Parsol 1789 and are very water-resistant. Oil free and PABA free. Convenient hands free application is great for sports and water activities. Gentle Lil Gator formulation is perfect for kids. Designed For Kids Or Others With Sensitive Skin. Paba Free, Spf 40 Sunscreen Is Non-Irritating And Offers Maximum Protection. Last 8 Full Hours. Uva-Uvb Protection. Smell incredible with our nourishing and anti-oxidant rich ingredients. Our body butter helps fight signs of aging while adding deep moisture and protection. 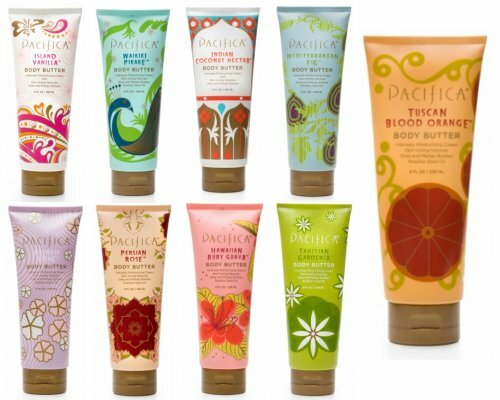 Made with nature's best moisturizers - shea butter, almond oil and safflower oil - Pacifica's paraben-free Body Butter is a skin must-have. Now available in tubes in our best-selling fragrances, making them easy to take with you anywhere. 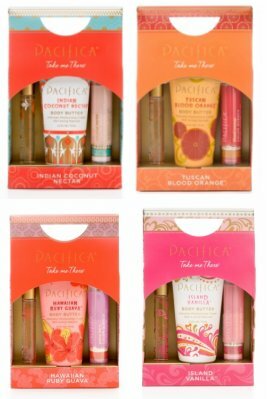 Pacifica Take Me There Sets are the ideal gift for everyone. Perfectly portable products that are easy to carry with fragrances that will carry you away! Each Take Me There Set contains our beloved purse-ready 2.5oz Body Butter, .33oz Perfume Roll-on and delicious NEW Color Quench Natural Moisture Lip Tint. As always, the gorgeous box defies gift-wrapping. Venomous sea creatures will bite or sting millions of people causing extreme pain and irritation. In a study, lifeguards experienced immediate relief from jellyfish stings by using Wipe Away Pain! The medicated solution in Wipe Away Pain! neutralizes poisons and delivers pain relief and a cooling medication that works to reduce redness and inflammation. In the study, those using vinegar demonstrated no pain relief and those using aluminum sulfate received only minimal relief. The study shows - Wipe Away Pain! works. 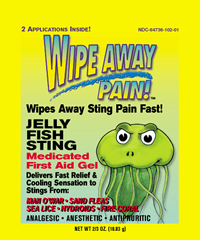 Sting Zapper for Jellyfish & Sea Stingersâ€¦ Zaps & Neutralizes the stings & bites from Sea Lice, Jellyfish, Man O'War, Blue Bottle, Fire Coral, and more! A must for divers, lifeguards, surfers, swimmers, snorkelers, fishermen and people who love water sports. 2/3 oz package contains two applications. 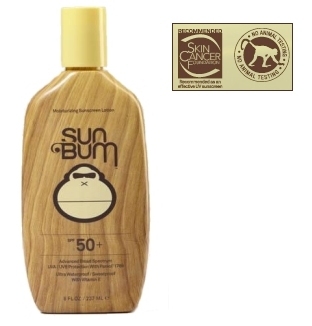 Sun Bum's SPFÂ 15 sunscreen lotion provides more thanÂ 15 times your natural protection from the sun.Â This moisturizing lotion will protect your skin from harmful UVA/UVB rays while enriching your skin with Vitamin E, an antioxidant that helps neutralize free radicals, which are the main cause of premature aging.Â Waterproof, so great for protection at the beachÂ and in the water. 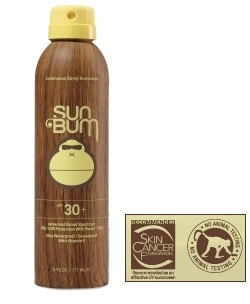 Sun Bum's SPF 30+ Continuous Spray Sunscreen provides more than 30 times your natural protection from the sun.Â This easy to use, ultra sheer/dry touch continuous spray formula will protect your skin with Vitamin E, an antioxidant that helps to neutralize free radicals, the main cause of premature skin aging.Â Â Don't get your hands all greasy when you don't have to!Â Great level of protection for the beach or pool. 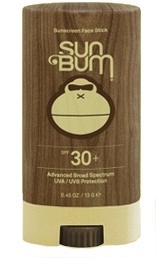 Sun Bum's SPF 50 sunscreen lotion provides more than 50 times your natural protection from the sun.Â This moisturizing lotion will protect your skin from harmful UVA/UVB rays while enriching your skin with Vitamin E, an antioxidant that helps neutralize free radicals, which are the main cause of premature aging. 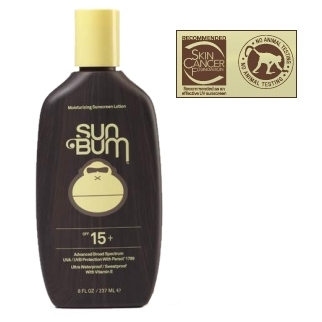 Sun Bum's Cool Down is a soothing and healing aloe cooling gel with Vitamin E.Â Moisturizes and restores dry and sun damaged skin.Â Carefully formulated to protect those of us who live and love in the sun.Â Aloe is commonly known for its healing and soothing qualities for the skin.Â Combined with the natural antioxidants of Vitamin E, this cooling gel helps restore and protect your skin cells after exposure to the sun and all other outdoor elements.Â 8 oz bottle. Babies have a lot thinner skin and thier body's natural protection system is still developing, so extra special care and consideration must go into protecting them from the damaging effects of the sun. That's why we developed a premium naturally sourced sunscreen for our kids and friends with super sensitive skin. Using a blend of mineral and natural ingredients that are proven to be gentle on a baby's skin, our new Baby Bum Formula provides the ultimate barrier of protection. 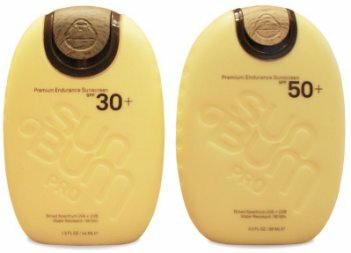 Sun Bum's Cool Down is a soothing after sun aloe lotion with Vitamin E and Cocoa Butter.Â Heals and moisturizes to help preserve your tan longer.Â You played hard to get your tan, so keep it longer! 8 oz bottle. We developed our PRO line for the days that we live for. 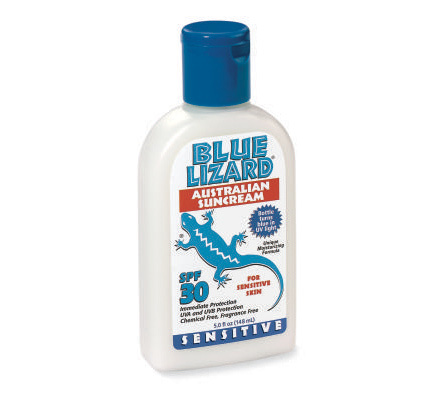 Our premium, mineral based sunscreen is specifically designed to offer the very best broad spectrum protection to those who work and play hard in the sun. It will never bleed into your eyes, never make your hands slippery, and won't come off during the most rigorous activities in the water, wind, or blazing hot sun. 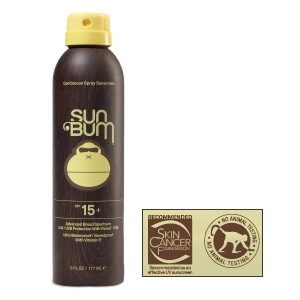 Sun Bum's SPF 15+ Continuous Spray Sunscreen provides more thanÂ 15 times your natural protection from the sun.Â This easy to use, ultra sheer/dry touch continuous spray formula will protect your skin with Vitamin E, an antioxidant that helps to neutralize free radicals, the main cause of premature skin aging.Â Â Don't get your hands all greasy when you don't have to!Â Â Moderate level of protection for the beach or pool.Â For longer times, or for those with light complexions, try the SPF 30+. 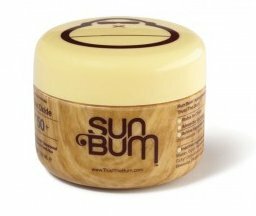 Sun Bum's Baby Bum line was developed because babies and toddlers skin is different from an adults. 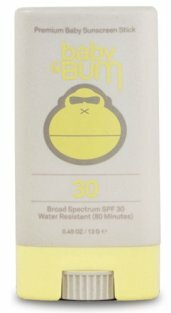 SPF 30 Broad Spectrum UVA/UVB protection is achieved using only one active ingredient, a non-nano zinc oxide. Inactive ingredients are naturally sourced, including the vanilla scent.